File photo: Protest for sending Hennepin County Sheriff’s deputies to Standing Rock. 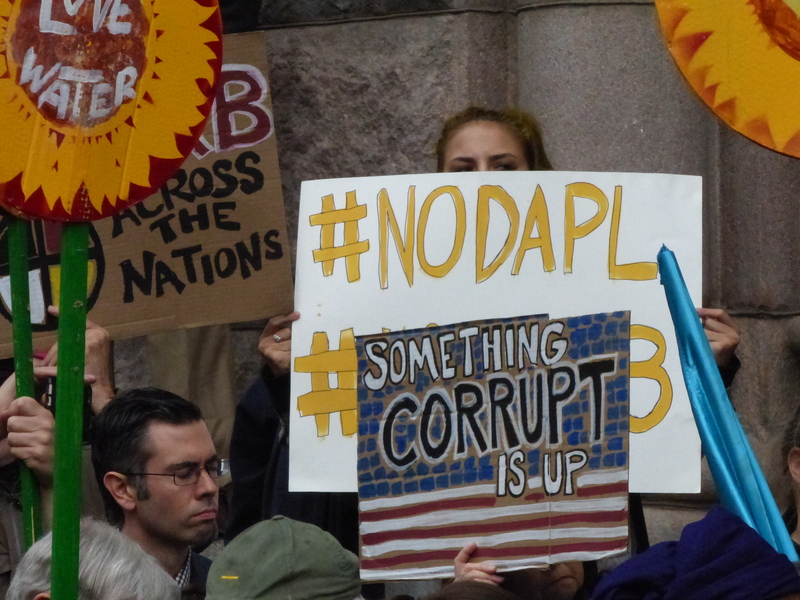 Energy Transfer Partners isn’t waiting for the Trump administration to green light the Dakota Access Pipeline (DAPL), it is seeking a federal court ruling to force the U.S. Army Corps of Engineers to approve it. Meanwhile, in blizzard conditions, the state of North Dakota is maintaining a blockade of the highway north of the Oceti Sakowin camp. This is endangering safety by making it more difficult for people to leave who want to leave. Analysts say Energy Transfer Partners has two potential reasons to seek a faster resolution: It is losing millions of dollars due to delays, and a longer wait could scuttle a $2 billion deal to sell a stake in the pipeline. This full court press is happening as severe winter weather has slammed the Oceti Sakowin camp near Cannon Ball, ND. As of 6 p.m. tonight, it was 3 degrees F with a wind of 25 mph. The low tomorrow is expected to be -15 F. Dave Archambeau II, chairman of the Standing Rock Nation, has encouraged people to leave, believing that the U.S. Army Corps of Engineers decision to deny Energy Transfer Partners the needed easement would delay the project in the near term. The Standing Rock Medic & Healer Council said in a statement that “Winter conditions are intense, but spirits at camp are high.” However, the Council criticizes the state of North Dakota for its continued blockade of Highway 1806 between Cannon Ball and Mandan. Our medical and logistical volunteers are evacuating patients/campers to the hospital and warming spaces as needed and are stabilizing patients in the meantime, coordinating with the Standing Rock EMS. As of 2:00PM CST, there have been no confirmed deaths or any critical care patients. There have been two cases of moderate hypothermia for whom the medics on the ground provided care. The main impediment to health is not the winter, but the state. The police roadblock on ND HWY 1806 is delaying the timely evacuation of patients and vulnerable populations. We have developed the capacity to keep the campers safe and warm, but are asking the state of North Dakota to cease its inhumane and unjustifiable blockade of highway 1806. The idea for a toy drive came out of conversations between Jim Bear Jacobs, Ursula, and Chas. Jim Bear, the founder of Healing Minnesota Stories, agreed to organize it. The collection will last from now until Dec. 29. (Toys will be delivered both before and after Christmas, as they are collected). If you need to drop off toys outside of these times, please email Terry Clements to make additional arrangements. Members and leaders of the Bearing Witness Retreat will be going to Standing Rock over the coming weeks and will take the toys as they arrive.